A tomato base is given a hearty portion vinegar and pepper to give this sauce a tangy North Carolina-tilt. 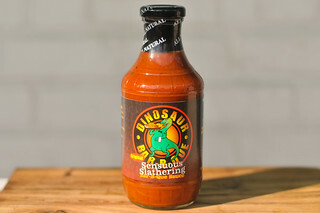 This bottle represents the second in a line five barbecue sauces Heinz released earlier this year. For this series, Heinz partnered with pitmasters across the country to give each sauce its own unique regional tilt. This particular one is done in a Carolina style, with Sam Jones getting the nod to develop the recipe. Heinz couldn't have picked a more recognizable name in Carolina barbecue—Sam is the grandson of Pete Jones who opened the renowned Skylight Inn in Ayden, NC back in 1947. Sam continues the tradition of cooking whole hogs over wood to this day and recently opened his own restaurant, Sam Jones BBQ, this year. The initial whiff delivers the extreme tartness you'd equate with a North Carolina sauce, but brings along with it a sweet and fruity tomato base that isn't so common in the Eastern part of the state. That sweetness is further contrasted with a peppery aroma that hints at what may be a nice hit of heat. Playing in the background are equal components of smoke and mustard, with just a tad bit of garlic that can be discerned after a few deeper smells. 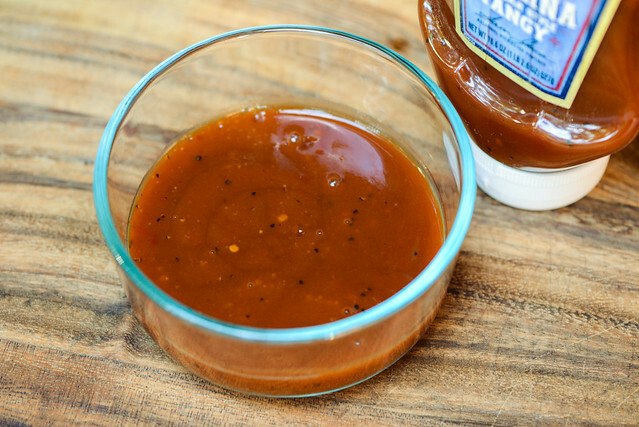 This rusty orange sauce is glossy and semi-transparent, which makes it easy to see lots of red, white, and black spice specs peppered throughout. Its consistancy sits just a notch south of medium and the sauce falls first in one big glob off a suspended spoon, followed by a quick, syrupy stream. As the sauce slows, a few long drips release before the pour ceases, and the silverware is left with a thin, transparent coating left clinging. Despite the heavy tartness in the aroma, this sauce starts off with a mild tang and equally paired sweetness. A fruity, bright tomato flavor comes out next, but the vinegar ramps up quickly to become almost completely dominant. Oniony and garlicky undertones roll in next, but are overtaken by a peppery heat that becomes the only challenger to the heavy vinegar. With a touch of smoke, this leaves the final flavor extremely tart with a medium heat and mellow smokiness. On the grill, this sauce coated the chicken leg in a thin, even layer that baked down well over indirect heat. When moved over the direct heat, there was light caramelization with some burn off here and there. Cooking the sauce pushed the flavor profile into more standard barbecue territory—the tartness mellowed and found a balance with the sweetness and tomato. The spiciness also lessened, leaving just enough heat to be noticeable, but not hot by common standards. The nuanced flavors, like garlic, onion, and smoke, were almost completely diminished, being lost to the heavy sweet ketchup base. 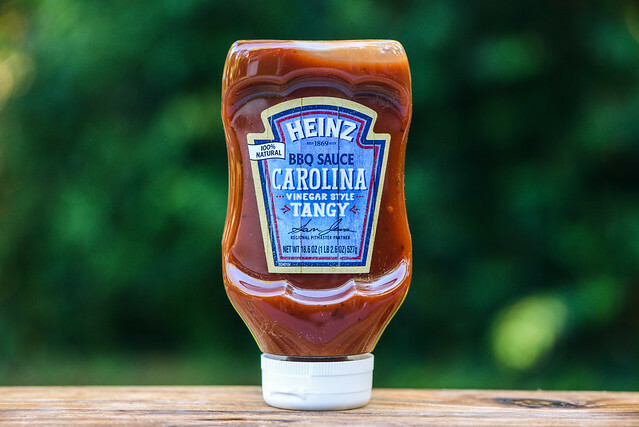 It's not hard to imagine how this sauce was created—ask a North Carolina vinegar man to create a sauce that has to feature ketchup prominently. This is what you'd get, and for what it is, it's not bad. Sure it suffers a bit of an identity crisis, but out of the jar you get this unique extreme tartness that isn't common for a supermarket tomato-based sauce. It also has a nice complexity with mustard, garlic, and smoke creating layers of flavor that go beyond what you might expect in an inexpensive major brand. A lot of that uniqueness goes out the door when being cooked though, but then again, a true Carolina sauce wouldn't be used in that manner. So when all is said and done, this sauce is decent, not remarkable, with the tug between a Carolina vinegar and standard tomato-based sauce being its downfall. 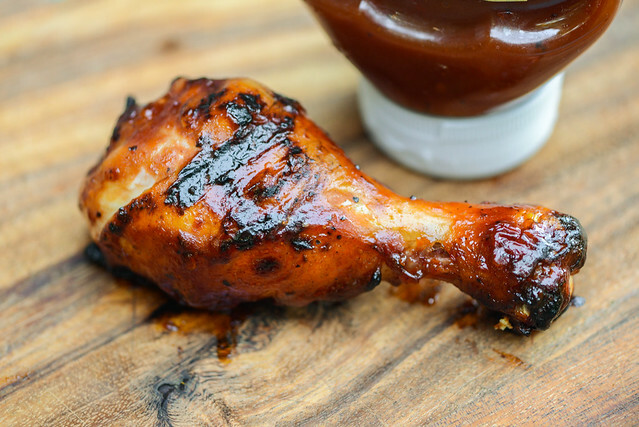 When I think of how I would use it, even though there are good things going on in this sauce, there are many other sauces I'd rather dose my smoked pork in or brush my barbecue chicken with. I'm a big fan of vinegar sauces and even use ketchup in the legacy recipe that I got from my grandmother. But I just couldn't get excited about this one when I tasted it.